You have what it takes to be a CIO. Do you have a strategy for getting there? Now you do. "Gregory Smith has written the definitive work on how to achieve leadership success in IT. This well-written and carefully researched book is a must-read for any IT professional with aspirations toward the top IT spot. Years from now, seasoned IT leaders will be crediting Smith's book with playing a role in their success." "Wow! Put all the tips, advice, and strategies in this book to use now. The road to the top is rarely straight—follow Gregory's advice and the path will reveal itself to you!" "While most professions have a distinct road map to the top, there is no standard career path to becoming a CIO. 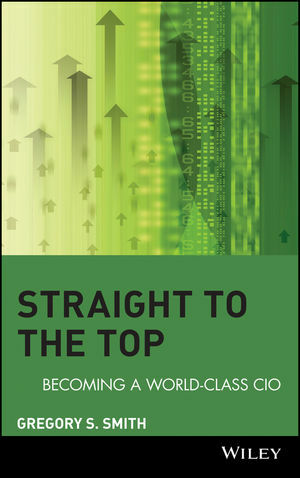 Smith addresses this unique challenge and provides aspiring CIOs with encouragement, advice, and essential skills based on years of his own and other CIOs' cumulative experience -- an important effort for the profession that Smith's fellow members in the CIO Executive Council embrace and applaud." "Teaching students what a CIO really does has been tough. We've had to choose between anecdotal treatments based on trade press articles and integrated academic frameworks that offer little in the way of lived experiences. Greg's book fixes that. By organizing interviews with leading technology executives, trade press reports, and his own experiences as a CIO, he provides an organized and comprehensive view of the job and its important role in modern organizations." GREGORY S. SMITH is the Vice President and Chief Information Officer (CIO) of Information Technology at the World Wildlife Fund in Washington,D.C. He has published several articles, including "Talking at the Top of the World" in CIO magazine, along with a variety of technology topics in eWeek and LAN Times. He was recognized as one of the top CIOs in the area of resourcefulness by CIO magazine and has given a variety of public presentations on the topic of information technology at conferences, including the Marcus Evans CIO 2004 Conference and the SAS M2005 Data Mining Conference. Mr. Smith also serves as an adjunct faculty member at The Johns Hopkins University in the School of Professional Studies Business and Education graduate program. Part 1. Building the Necessary Skills and Relationships. Chapter 1: Key IT Skills to Have. The CIO and the CTO—What’s the Difference? The Changing Role of the CIO. How Important Are Core Technology Skills? Chapter 2: Methodologies, Projects, and IT Change Management. What Are Methodologies and Why Are They Important? Project Management—The Key to Success. IT Change Management—The Key to Minimizing Unnecessary Downtime. Chapter 3: IT Standards and Governance. The Importance and Benefits of IT Governance. IT Strategies, Investments, and Budgeting. Communicating IT Standards, Policies, and Processes. Chapter 4: Learn the Business and Build Key Relationships. Think Like a Consultant to Learn the Business. How to Build Effective Relationships—Internal and External. Getting Quick Wins to Establish Credibility and Trust. Focus on Delivery, Delivery, Delivery. Chapter 5: Effective Communication Skills and Styles. Communicating Project Wins—Giving Credit Where Credit Is Due. Part 2. Preparing for the Role of the CIO. Chapter 6: What Executive Recruiters Are Looking For. Recruiting Trends for IT Executives. Contacting and Working with an Executive Recruiter. Preparing for a Meeting with an Executive Recruiter and Negotiating to Win. Survey Results from Executive Recruiters. Chapter 7: Building the Right Network. Develop Your Technology and Business Network Early. Where Do Consultants and Vendors Fit In? Chapter 8: Vendor and Sports Management. The Secret to Outsourcing Success. Integrating Sports to Build Relationships and Grow Your Network. How Much Business Is Done Out of the Office? Chapter 9: Contract Negotiation and Financial Management. Contract Negotiation Tips and Best Practices. Financial Management—Think Like a CFO and Act Like a CIO. Budgeting and Forecasting—Aligning IT with Business Strategy. Tools to Minimize Financial Risk. Making Friends with the CFO. Chapter 10: Risk/Reward and Knowing When to Jump. Risk and Reward—Nothing Wagered, Nothing Gained. How to Mitigate Risks and Still Succeed. When It Makes Sense to Jump to the Next Company. Chapter 11: The Role of the CIO—Enabler and Visionary. The Top Five Mistakes Most Often Made by CIOs. The First 100 Days—Tips from World-Class CIOs. CEO and CIO Common Gaps in Expectations.